Mars has been a prominent figure in the lens of human awareness, imagination, and sense of adventure for centuries. It's a fiery spark in the night, a celestial laser-pointer dot drawing our cat-like curiosity into space. But could our neighboring planet's value to us exceed our wildest imaginings? Is it a source of rich resources that could fuel voyages to even farther-out destinations? Is it a key to answering the age old question, "Are we alone"? Could it even be our best insurance policy for the survival of our species? Food for thought. Scarcely a century since fiction writers began imagining a trip to Mars and only 50 years after we sent the first robotic probe, we have sent dozens of spacecraft, a handful of landers and still have the wheels of two rovers turning in those rusty soils. The rovers Opportunity and Curiosity are drilling into rocks and scooping up dirt to look for signs of past water and life-friendly environments and have found such evidence in abundance in the composition of mineral deposits and structures of rock formations. Orbital spacecraft like the Mars Reconnaissance Orbiter may even have detected the action of sporadic liquid outbursts in present times. That Mars once had a warmer, wetter, probably much Earthier environment in the past is a speculation supported by mounting evidence. Sending humans to Mars has been an on-again/off-again shuffle over the years. Back in the Apollo era when our country was spending a lavish 4% of the federal budget to put humans on the moon, there was optimism that this wind in the sails of the spirit of exploration would propel us not only to the moon's surface, but carry astronauts to Mars, and ultimately beyond. But the winds of public opinion and federal spending shifted and Apollo was cancelled, and as the story goes we haven't been back there since. In the George W. Bush era, the "Moon, Mars and Beyond" initiative challenged us to return to an outward path in the solar system by returning to the moon to establish a permanent base, and turn our sights again to Mars as the next destination of human exploration. Recently, NASA Administrator Charles Bolden rephrased the M-M-B mission plan to better align the steps toward Mars with budgetary realities and to balance human space programs with more cost-effective robotic missions. The more measured pace in the plan Bolden outlined would place humans on Mars sometime in the 2030s, and include an intermediary program to capture, move into lunar orbit, and explore an asteroid--largely for proving that we are ready for the considerably longer mission to Mars. Critics of NASA's plan, some in Congress, want NASA to pursue a more direct route and quicker pace to the surface of Mars—and while Bolden has signaled openness to input and "tweaking" of the plan, he states the shorter 10-year horizon some are pushing for is not financially "in the cards." Mars is in many ways a logical next step for humans in space. We can return to the moon, to study it further, to exploit its resources, and to further practice our set of skills for existing remotely beyond the Earth. The moon is an "easy" step outward since it is so close. But Mars is the next step upward. As a subject of scientific interest, Mars could prove to be the site where we find evidence that life on Earth is not unique in the universe –a defining moment in history if there ever will be one. As a subject of human interest, Mars may be where we take the first stab at ensuring our survival as a species in the cosmos. 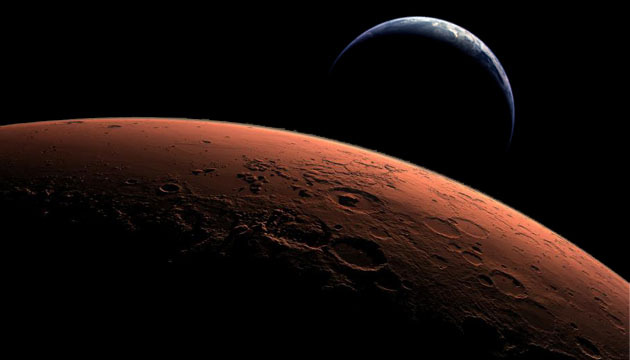 Some see Mars as a principle factor in the equation of the long-term survival of the human race. They posit that as long as we, as a species, live dependently on the Earth, a single planet, we are vulnerable to extinction by events of global devastation like a major asteroid impact, mega-volcanic cataclysm, or fatal self-inflicted mayhem like nuclear holocaust or runaway environmental collapse. With an established self-sufficient presence on Mars, should the Earth experience devastation then humans living on Mars could carry on the torch of humanity. I hope to see the day when the first humans set foot on Mars—though I think a report of finding evidence for life there would be the more exciting news. Personally, I'm rooting for both within my lifetime.